Did you ever have any special opinion about Sea Buckthorn in skincare? Honestly, I never thought about it before I started trying the Purito Sea Buckthorn Vital 70 Cream. Usually, when I hear Sea Buckthorn I think about tea, winter, and herbal scents. But then I received this orange tube of facial cream from Purito and suddenly I was obsessed with it! Why? Let me explain! Purito is a rather young Korean brand with cruelty-free and 10-free skin care products. The products are free from paraben, ethanol, surfactants, artificial coloring, fragrance, triethanolamine, phthalein, triclosan, petrochemicals, and benzoyl peroxide. Moreover, the products gain a lot of popularity these days because of their short and yet effective ingredients list. I have reviewed the Purito Pure Vitamin C Serum and the Purito Snail Repair Advanced 91 Serum and my beloved Purito Centella Green Level All In One Mild Pads before and there are more to come in future! The Purito Sea Buckthorn Vital 70 Cream is a nourishing moisturizer enriched with 70% Sea Buckthorn Fruit extract, highly concentrated with vitamins, and therefore the perfect brightening care for making dark and dull skin revitalized. The cream comes in a tube and contains 50ml of volume. Like all Purito skincare, the product comes packed in a cardboard box with all the relevant information. 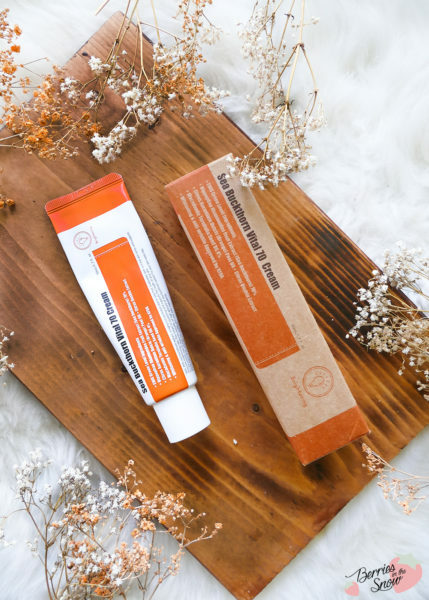 The design of Purito products is not especially cute or elaborate, but the products have a signature look and each skin care line has a defined color depending on the key ingredient. Here orange is the signature color. Hippophae Rhamnoides, also known as Sea Buckthorn or Sandthorn, is a plant commonly spread in Europe and Asia. It has been used in ancient Greek as an herbal remedy for skin diseases, digestive problems and as medicine. These days the plant is used and valued for many reasons. The Sea Buckthorn fruit is known to have a high content of vitamins, especially vitamin C. But it doesn’t end with vitamin C, the fruit extract also is rich in Vitamin E, D, E, and B. Additionally, it is rich in amino and fatty acids. All these components of the Sea Buckthorn Fruit extract act positively when applied topically on our skin. Vitamins prevent aging and have exfoliating properties. Fatty acids keep the skin hydrated, smooth, and resilient. This leads to glowy and brightened skin. 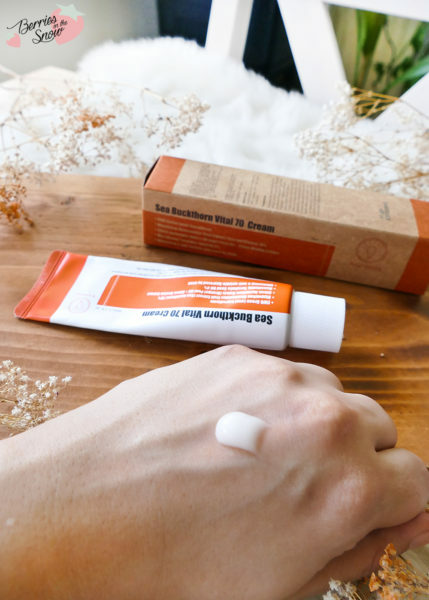 With 70% Sea Buckthorn Fruit extracts this cream provides the skin with 2000mg Vitamin C, and that’s really amazing! 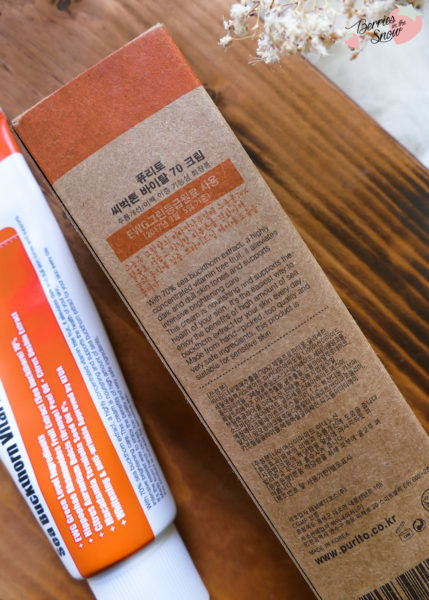 When we look at the full list of ingredients of the Purito Sea Buckthorn Vital 70 Cream we will spot Orange Peel Oil and Satsuma Orange Extract as natural fragrances. 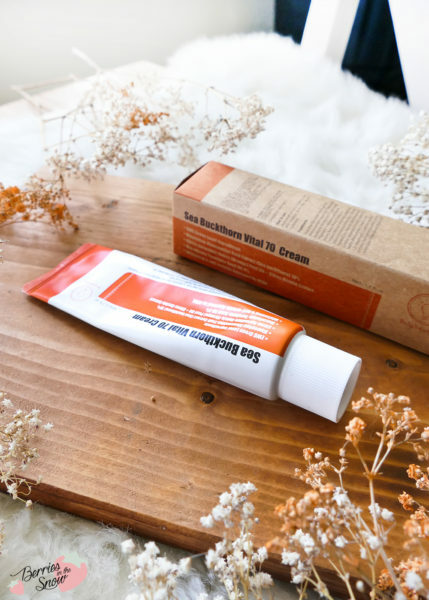 The cream also has a wonderful fruity and orangy scent that is addictive and nothing like the artificial orange scents that remind you of bathroom cleansers. Then we have 4% Macadamia Seed Oil included in this cream for hydration. This is accompanied by glycerin, hyaluronic acid, and panthenol. Last, but not least, niacinamide for more brightening properties. According to SkinCarisma all the ingredients are safe to use according to EWG! 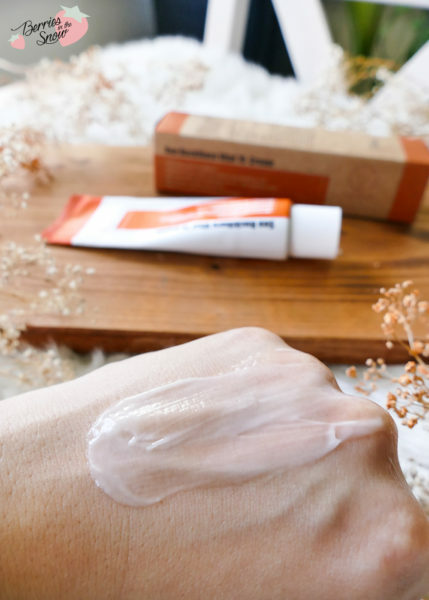 The Purito Sea Buckthorn Vital 70 Cream has a mix between balm-type texture and gel texture. The color of the cream is light orange, and as I said before, it has a wonderful and very natural orange scent that reminds me of the moment you peel oranges. The cream spreads smoothly and feels nourishing and hydrating at the same time. I also feel like my skin feels moisturized all day and even after it is absorbed the skin will feel more bouncy. 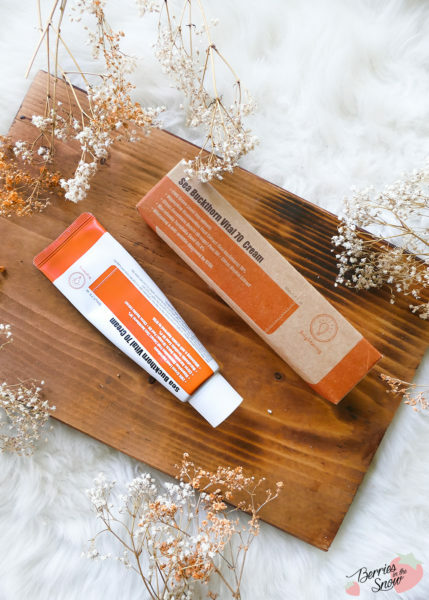 This cream doesn’t absorb fully and without a trace like for example the A;T Fox Tea Tock Water Cream, but will leave a feeling of a moisturized skin if you know how I mean the difference. I would describe the texture as suited better for dry skin types because it has a kind of richness to it. 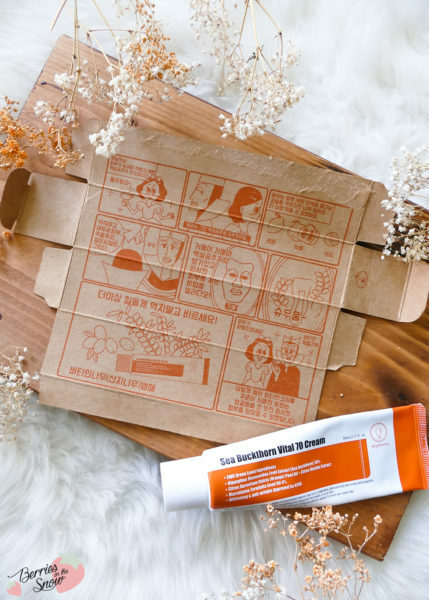 Inside of the cardboard box of the Purito Sea Buckthorn Vital 70 Cream, there is a cute comic describing the brightening effect of the cream with help of Snow White and the Evil Queen: the Queen wants to have smooth and bright skin like Snow White. According to the magical mirror of the Queen, this cream is supposed to be the solution for it. After having used half of the tube excessively I can confirm that this cream gives you the most wonderful glowy and bright skin! I’m so addicted to this moisturizer and it’s been a long time that I have used a cream so rigorously. Do you love orange scents? Are you looking for a cream that gives you ultra glow and bright skin, and is nourishing and hydrating at the same time? 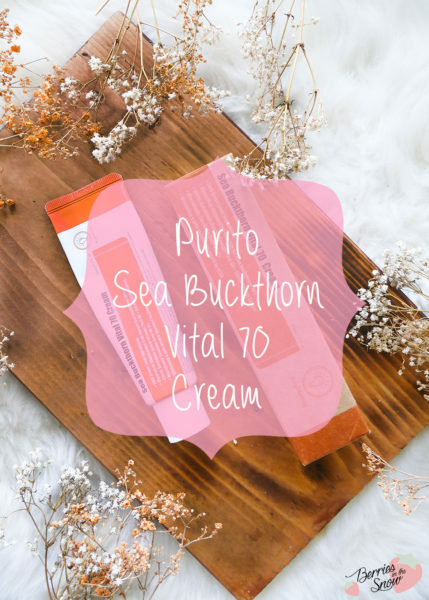 If yes, the Purito Sea Buckthorn Vital 70 Cream might be the perfect solution for you. Plus, a short ingredients list consisting mainly of Sea Buckthorn Fruit Extract and all EWG green level ingredients! Hands down, this is a perfect cream for me! The tube retails for 19 US$ from the official page, but you can also get it from Beautytap for the same price (use the code BERRIES15 for 15% off non-sale products). Also, check out my discount and coupons page for the latest deals. Have you heard of Purito? Do you use any skincare products using Sea Buckthorn Fruit Extract? Just as a short reminder: All products mentioned and reviewed on this blog are of my personal opinions. This product here was sent to me for reviewing purpose by http://puritoen.com which doesn’t influence me in providing my honest opinion on the products. Das klingt total gut! Ich mag K-Beauty auch gerne. Glaube das muss ich echt auch mal testen! Ich kannte die Marke bis jetzt noch nicht. Hört sich aber sehr gut an. Vielleicht probiere ich sie auch mal aus. Kosmetik aus Korea mag ich ja ebenfalls sehr gerne. Sanddorn kenne ich viel aus der Naturkosmetik. Die Marke kannte ich bisher noch nicht, aber Produkte aus Korea sind in der Regel immer spannend. Vielen Dank fürs Vorstellen.